It's been a while since I did a house tour, so I thought today was as good of a day as any to start that back up again! Rather than do an entire house tour, I am showcasing a specific corner or area of our home that we have worked on or are excited about. Today is the staircase landing! 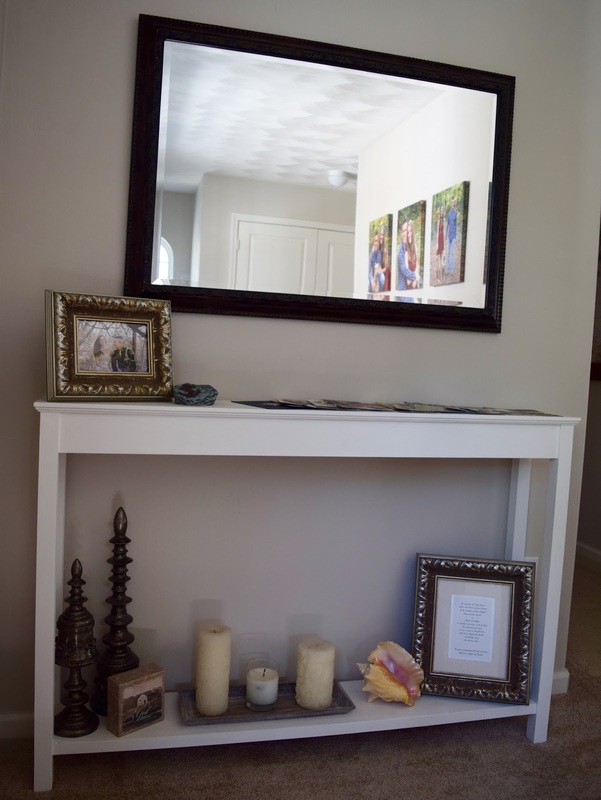 I used mostly pieces I had lying around the house already (cheapo, party of one), the large mirror being one of them! I love that mirror and was so excited to finally find a place to use it in our new home. Parker built the table, and I painted it white to match the trim. If I haven't gushed lately about how great it is to have such a handy husband, I'm gushing now. So nice. Parker (I think it was Parker) came up with a great idea to display the previous year's Christmas cards across the top. It's so fun to thumb through them and always something guests take a minute to look at. I'll replace them each January so we can enjoy them a full year! 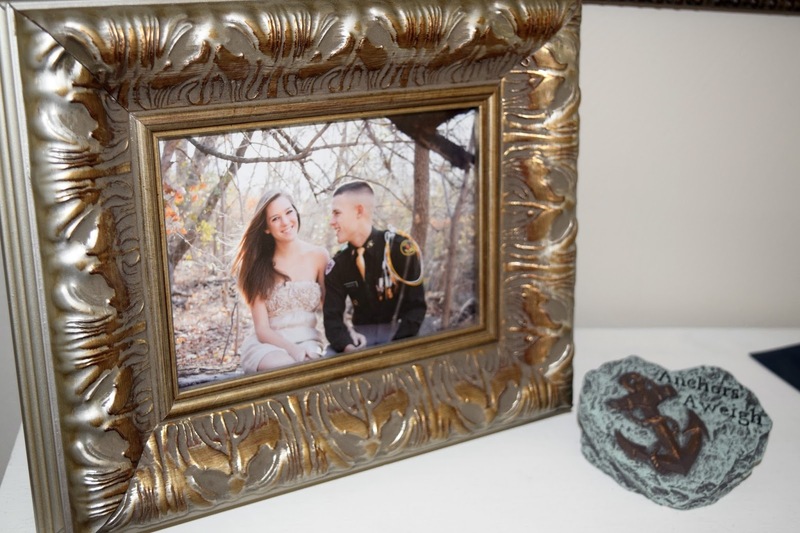 The picture on top of the table is one of our engagement pictures (how was that almost six years ago?! ), and the paperweight that says "Anchors Aweigh" was gifted to me by a sweet friend. It's fun to have a little ode to the Navy and to this blog displayed. I asked Parker to add a shelf to the bottom of the table so we could display little knick knacks, and the left side holds all items recycled from other areas of our home. The two outside candles were actually lit at our wedding! 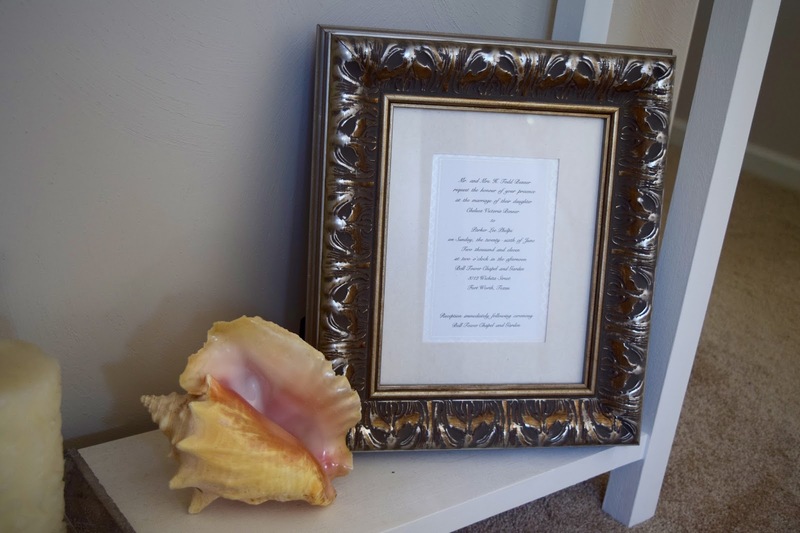 The right side of the bottom shelf holds our framed wedding invitation and a shell we purchased for $5 on our cruise this past May in The Bahamas. Other than a Christmas ornament, this was the only souvenir we came home with! That's about it! It's simple, but this little space makes me so happy. The great thing about Parker building the table was he could build it to whatever specifications we wanted. We didn't want it to feel crowded, so the table is less than a foot wide. 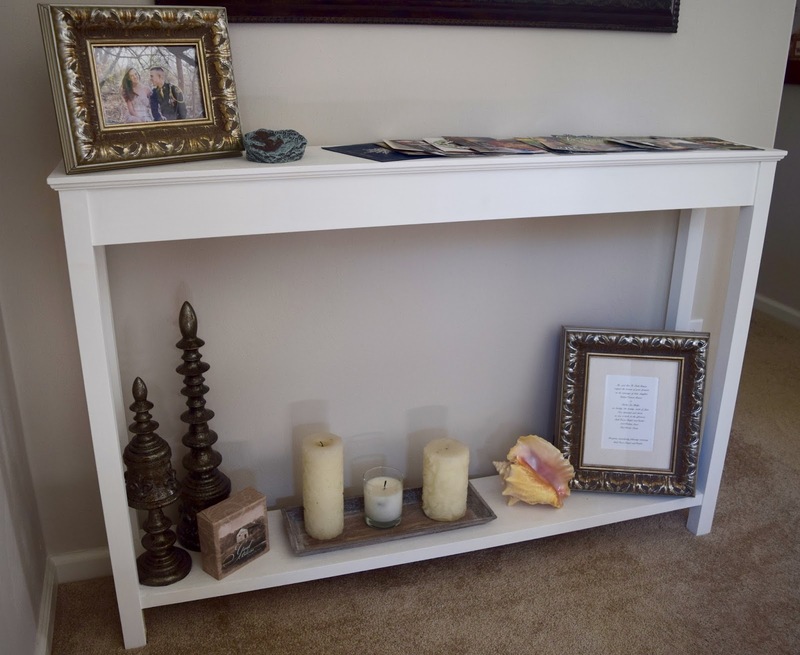 It fits the space perfectly and is still wide enough to store a few of our favorite things. 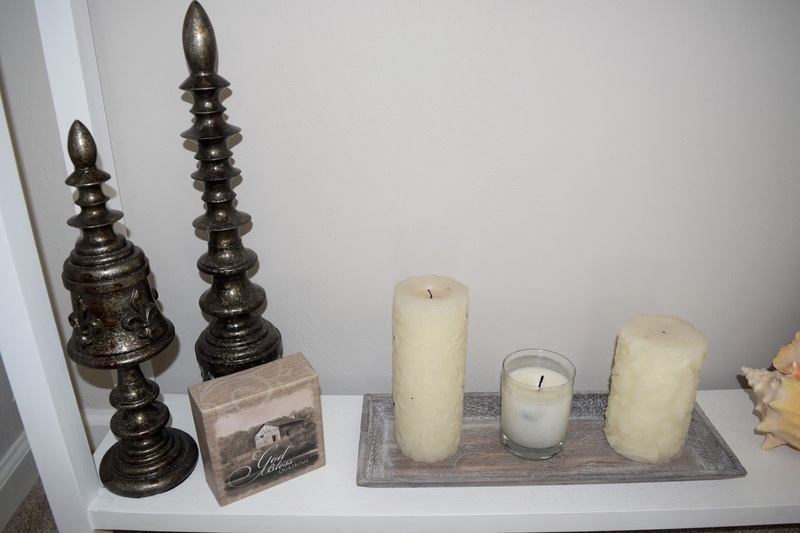 The picture frames and dark silver decorative stands (what in the world are those things called?) came from Hobby Lobby. Everything else is old or a gift, so I am not sure where it came from! and YESSS to spouses who are handy! GO PARKER! The piece he built is so perfect! I love that you were able to add so many things that have meaning to you guys & displaying the christmas cards year round is such a fun idea! So cute! That's a great use of Christmas cards... I hate throwing them away every year, but I'm never quite sure what to do with them! 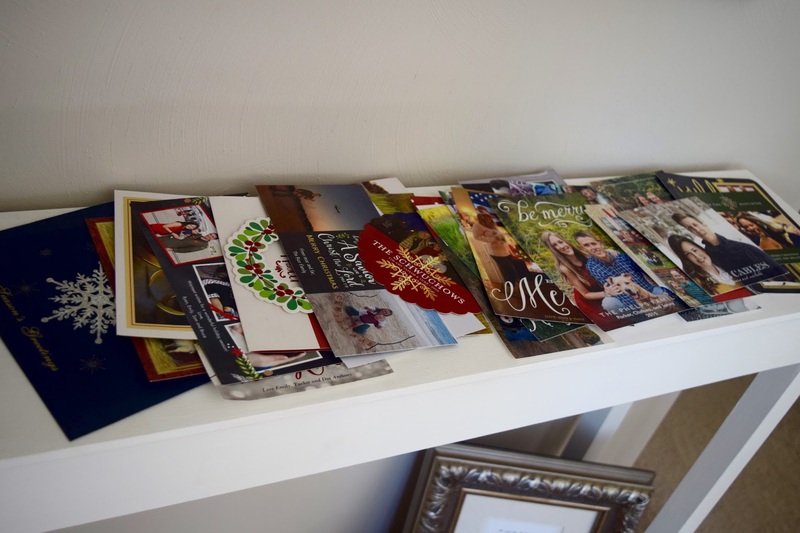 This is really cute :) I love the idea of displaying the Christmas Cards! I love that! The table is gorgeous, and I love the idea for the Christmas cards. Very cute! I LOVE your landing! The table is fabulous. Off to see the rest of your house. This is so cute! I am the worst at trying to display anything besides pictures. I feel lost and don't want it be cluttered. You did a great job! I love the card idea for all year!